So now that I’ve moved into an apartment here in Boston, no more free breakfasts and dinner from the hotel! Which is a good thing since today starts Day 1 of my clean eating challenge! Groceries here in Boston, is a quite peculiar story. I live next to a Whole Foods Market which is fantastic, however there is a reason they are nicknamed “Whole Paycheck!” The closest Target, Wal-mart, etc are about an hour public transportation ride and then you have to haul all the groceries back. It isn’t a fun situation and by the time you’re done, it’s nighttime and no energy to cook. I had heard about a delivery grocery service through a co-worker and decided to check it out. 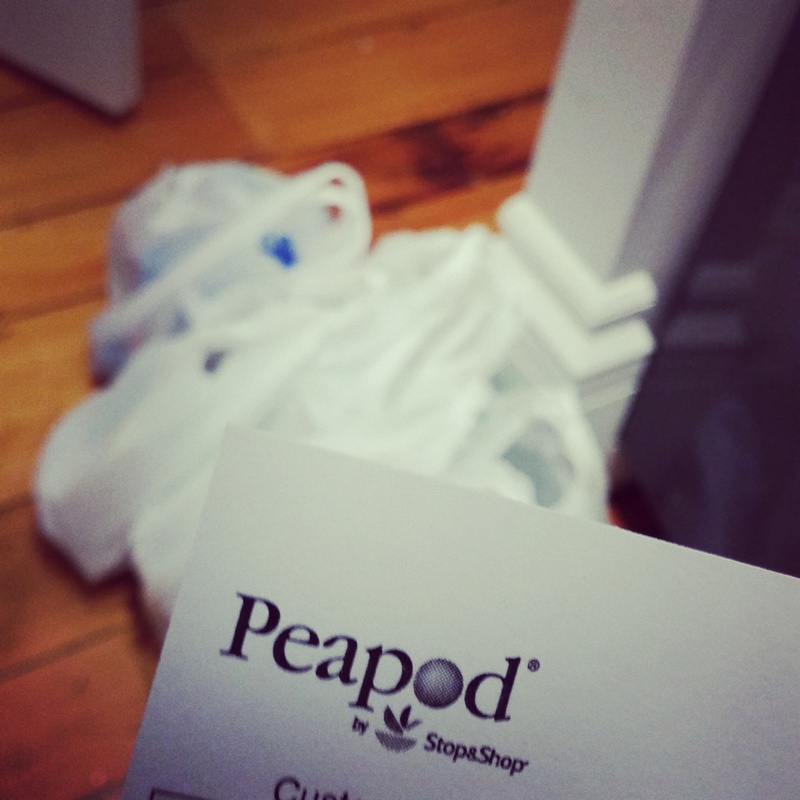 Peapod by Stop&Shop let’s you do all your grocery shopping online. You can go to their website or app and pick out from a variety of items. I ordered some fresh produce, some meats, and even a single serve blender (hello smoothies!) on their website yesterday. They let you use filters such as gluten free, dairy free, and weight watchers approved for you to choose healthy choices which was an already winner for me! I also created my own sugar free and organic filters to use. After you pick your list, you are able to pick a delivery time up to two weeks out. They give you a few options where you can choose a two hour window or save some money and do a larger window. When you choose the larger window, they just drop off the groceries while they’re in your part of the neighborhood so it’s more efficient for them and it also saves you money! They will text you an ETA so it’s not a total guess as a time either. Don’t you wish cable installers and repair men did that! Anyways… back on track. After you pick a delivery time, you pay with an e-check or a credit/debit card and you wait. If you have coupons, you can use them too! The delivery driver takes them when he gets there. I set my delivery time for 7:00 AM – 9:00 AM this morning and anxiously waited to see how reliable the service would be. About 8:17 I got a text saying my delivery was next! Ten minutes later, I got another text saying my groceries were here so I headed down my spiral staircase to the front door where a wonderful delivery driver was waiting for me. Needless to say I am very impressed with Peapod and will be ordering again next time I need groceries! Everything was fresh, stayed cold during the ride and their customer service was fantastic. I highly recommend them to anyone who has the service available to them as it makes getting groceries in Boston MUCH easier. Later today I decided it was lunchtime… I had a wonderful frozen pizza sitting in my freezer that was staring at me so I said okay I’ll eat you! Now remember, I only have a stovetop and no microwave so cooking oven meals is out of the question. Well what did I forget about when I bought the pizza? Yep… oven cooking ONLY. Grr… This pizza, however, was organic and clean so I was refusing to pay $20 for a delivery of an unhealthy greasy mess! I also refused to cook it in the microwave as I knew it would become messy, so that left the stovetop. Aha! Perfect idea! The best solution for a crunchy crust and melty cheese. 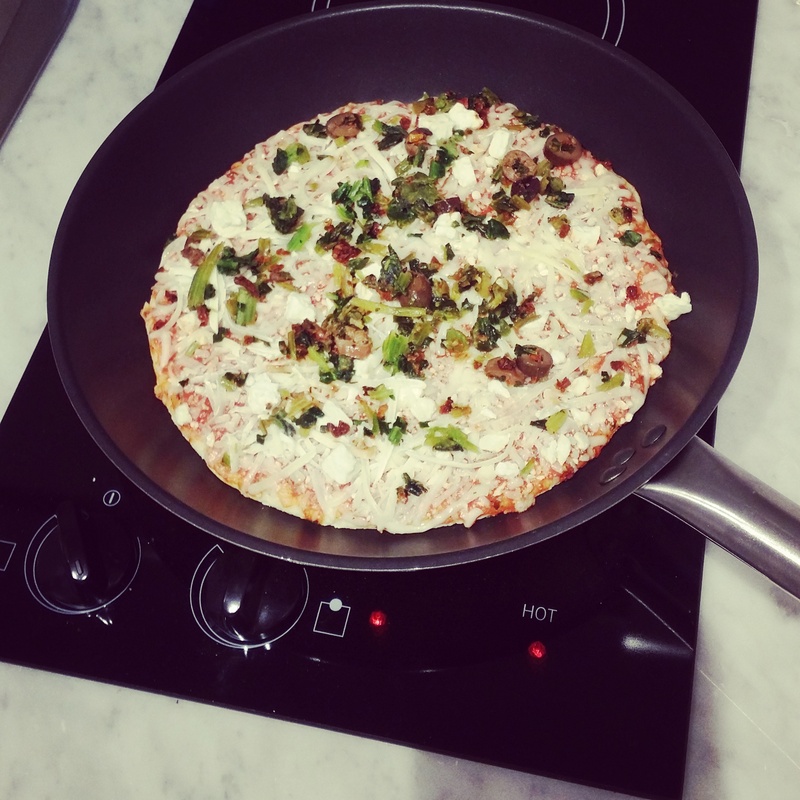 I stuck my pizza in the biggest skillet I had, cooked on high for about 5 minutes to crunch the crust then let cook on medium for another 10-15 until the top was melty and hot. It would have cooked faster but this skillet did not come with a lid, so I hung up laundry while it cooked and viola! Perfect pizza! I do have to say, it came out even better than if I had cooked it in the oven in my opinion! While I was at Whole Foods the other day I did let the frozen pizza jump out at me, but one thing I did not let jump out at me was their spa water. It looked SO delightful. For those of you who don’t know what it is, it’s just water bottles with fruit inside! So it is pre-infused water. I decided to make my own since I knew I had bottled water back at the apartment so I set off to find some cucumbers and mint. Didn’t find the mint but settled for a cucumber. 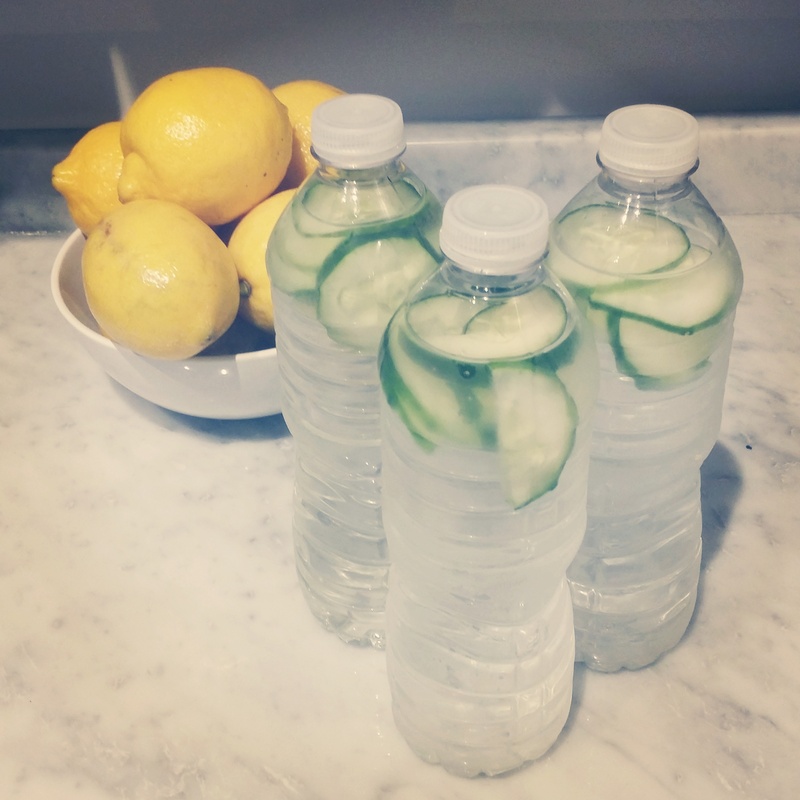 Today I cut it up and pre-made a few waters for this week so that I can grab and go with some refreshing cucumber water and at nothing compared to the original price! This will definitely be a weekly habit to have pre-made infused waters to take to work with my lunch. So these are my travel tips for you today! They are frugal, fun, and such a help to someone who is always on the go. I am now going to sit back, watch the NASCAR race as I cheer on Jeff Gordon and relax with some cucumber water! Let me know in the comments what your travel tips are or if you want me to share any more tips.